What are the All-Wheel-Drive Toyota Vehicles? If the winter drive between Sylvania and Maumee has you worried, consider upgrading your ride to a vehicle with all-wheel-drive. All-wheel-drive provides the additional traction and braking power vehicles need when tackling icy roads and uneven terrain without adding the excessive fuel consumption that can often accompany four-wheel-drive vehicles. The compact Toyota RAV4, which seats five, and the midsize Toyota Highlander, which seats eight, offer drivers access to all-wheel drive as well as hybrid engines options. The advanced performance options of these SUVs give drivers the opportunities choose just the right balance of traction and fuel efficiency. The Toyota Sienna is one of the only minivans on the market to feature all-wheel drive. This refined vehicle is perfect for families who need the extra seating, cargo, and storage space. The affordable base price, powerful V6 engine, and an EPA-estimated fuel economy of up to 27 mpg/highway, the Sienna is a top choice for busy families who want to do it all safely. 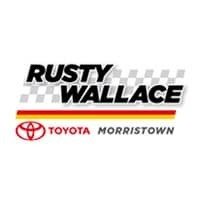 If you’re looking for a safer and more controlled ride, you’ll find it in one of the all-wheel-drive Toyota vehicles at Rusty Wallace Toyota. Contact us today or visit our showroom Morristown test drive an AWD SUV or van, and we’ll help to decide if leasing or buying is best for your budget. 0 comment(s) so far on What are the All-Wheel-Drive Toyota Vehicles?